Springtime has begun in northeastern Pennsylvania. As the ice recedes transforming the lake, the rift created tells a tale of two seasons — one going and one coming. The coldness of winter slowly ebbs as springtime’s warmth makes its mark. 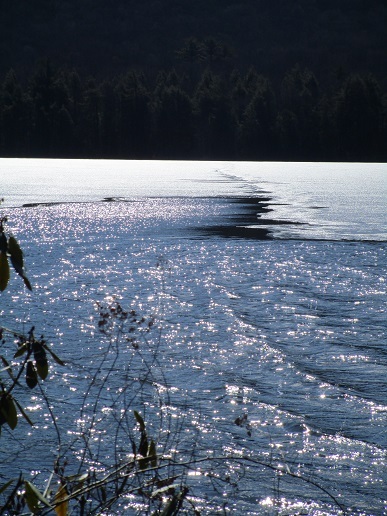 Soon the ice will disappear for the season, bringing a huge amount of opportunities for viewing radiant beauty, natural wildlife and recreation enthusiasts in action. The season flows in like the water from the mountain streams that feed the lake. 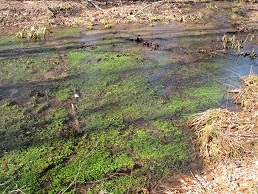 This greenery from a tributary stream shimmers with light-green vegetation, a tell-tale sign the transition has begun. Looking outside, I’m sure you can see a subtle transformation in nature as the mauves and browns prevalent in winter give way to springtime greens, yellows and reds. Daylight begins sooner each morning and ends later each evening, promising warmer temperatures. The longer daylight hours, more brilliant colors and warmer air entice us to venture from our hibernation and beyond the four-walled cocoons where we dwelt for the past few months. We leave behind the dark days of winter as daylight expands. of songbirds as they usher in a new day. If we choose to walk on one of the area’s many trails, the smell of pine needles and thawing earth teases our noses. A light breeze, still cool from spring’s newness, may tickle our faces and ears as we embark on a journey to breathe in the season’s fresh, crisp air. Springtime also inspires a renewal of our Spirits. As we shed the lethargy and coldness of the winter of our souls, the Light expands our hearts to feel the precious gifts of renewal and rebirth so generously provided to each of us. Our awareness of this and many other blessings grows as we enjoy the once-again-seen beauty of the world around us. Each season holds its own unique offerings, but springtime seems to top them all. Like the daylight hours, our Spirits expand to take in the ‘new’ gifts and springtime blessings. Happy Spring!! This entry was posted in Nature, Spiritual Living and tagged inspired living, Nature. Bookmark the permalink.